Sam just got paid to look over and talk about future Lego Mindstorms add-ons as part of a Mindstorms focus group. Also, Sam and Arthur each won a Lego Throwbots set in an online contest. Sam starts a lot more of these than he finishes -- you'll see that a lot of them are "in process" -- and every so often gets back to them and adds a few more paragraphs. He and his little brother Arthur also like to make up Lego stories while we're doing things like walking to the grocery store, many more than actually ever end up getting written down. 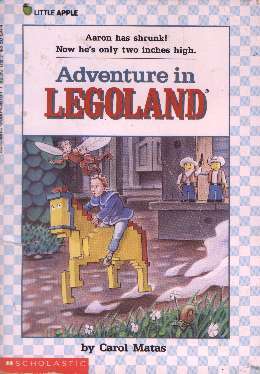 We also have a collection of other people's Lego stories: Lego's "The Golden Medallion" comic book, and the books "Adventure in Legoland", "Safari Adventure in Legoland", "Doctor Dog" and "Edward's Skyscraper." 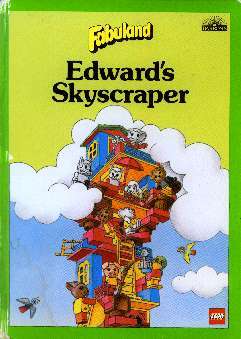 We also have the Dorling Kindersley Ultimate Lego Book as well as a big stack of their Lego puzzle and maze books. We've been pleasantly surprised to see Lego blocks/minifigs turn up in various games, so we thought we might as well list them for others who like such things. The non-online computer games are all of the DOS/Windows variety, because that's what we have. Jazz Jackrabbit Holiday Hare 1995 has one level where the landscape, buildings, etc. are all made of Lego blocks (click the link to see screenshots as well as being able to download this shareware game), and you have to shoot some not-so-great-looking minifigs. Smashing Pumpkins into Small Piles of Putrid Debris -- the best thing in this game is that at one point a very realistic-looking Lego chef shows up and throws pumpkin pies all over the place. Yes, I'm completely serious. "Mindfinds" made a really really nice Lego-Minifigs MahJongg tile set for Ron Balewski's MJWIN and Mah Jongg '97 shareware games. We have Lego's computer games Lego Island, Lego Chess and Lego Racers, which are all fun. We also have the Lego Timecruisers board game. The official Lego site features a variety of cute online Lego games. 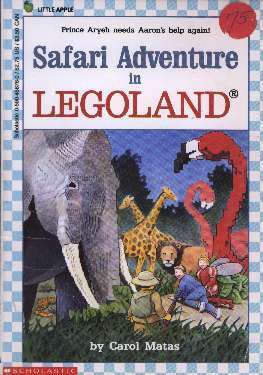 Legoland California's web site also has a Concentration game. Frank's LEGO(r) Games and Wargaming Links Page has links to rules for many Lego war games. The Games for the Lego Maniac page has online Lego wordsearch and tic tac toe games. Sam has also programmed some Windows computer games of his own featuring Lego characters -- one of these days you'll probably see one or more of them listed here too. LUGNET, the International Lego Users Group Network, has pictures and descriptions of almost every Lego set ever made, in addition to a large number of active Lego discussion groups and huge collections of reference materials, news and links. 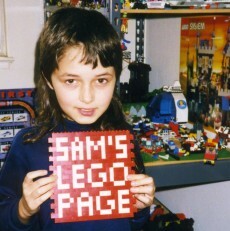 You can even create your own Lego web pages there. The background used on this page is a "derivative work" of a Fibblesnork Backgrounds page image, made and used with permission of the original creator Todd Lehman. LEGO(r) is a trademark of the LEGO Group of companies which does not sponsor, authorize or endorse this site.